Howlin' Wolf Records: SIX STRINGS: Stephen Baysted scores new Exhibition on Screen film The Impressionists - And The Man Who Made Them"
Stephen Baysted scores new Exhibition on Screen film The Impressionists - And The Man Who Made Them"
British composer Stephen Baysted ("Matisse: Live from the Tate and MoMa") reunites with award-winning film-maker Phil Grabsky and Seventh Art Productions ("In Search of...Haydn, Mozart, Beethoven, Chopin" composer series, "Concerto - A Beethoven Journey") to score "The Impressionists - And The Man Who Made Them," a new documentary feature in the acclaimed 'Exhibition On Screen' series of films bringing blockbuster art exhibitions from galleries around the world to the cinema, in stunning high definition. The Impressionists screens in UK cinemas nationwide from May 26. Recorded at Air-Edel Studios in London, Baysted's original score for The Impressionists features performances by pianist and mezzo soprano Susan Legg ("A lustrous mezzo soprano" - The Sunday Times) and soprano Louise Walsh (Sir Andrew Lloyd Webber's The Phantom of the Opera) with additional piano by Jonathan Plowright ("One of the finest living pianists" - Gramophone Magazine). A score album will be released through Baysted's publisher label Red Rocca on May 28. 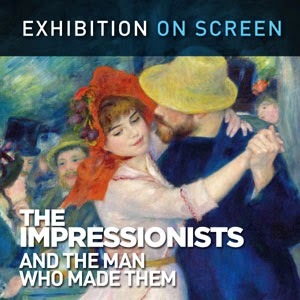 The Impressionists - And The Man Who Made Them tells the story of art's greatest revolutionaries in the most comprehensive film ever made about the Impressionists. With unparalleled access to the highly anticipated international exhibition at the Musée du Luxembourg Paris, National Gallery London and Philadelphia Museum of Art, the film captures some of the world's most famous paintings in stunning high definition - featuring universally loved masterpieces by Monet, Degas, Cézanne, Renoir, Pissarro and many more - as well as interweaving the incredible story of 19th century Parisian art collector Paul Durand-Ruel and the extraordinary lengths he went to make Impressionism a household name. The Impressionists screens nationwide in UK cinemas from May 26 and in select US theatres on July 14.